Lewis & Clark Park, fast paced football action with the Sioux City Bandits of the Champions Professional Indoor Football League (CPIFL), Sioux City Musketeers (USHL Tier One) hockey games, casinos and IMCA racing. College football, volleyball, basketball and baseball teams and numerous high school athletic activities round out an outstanding array of sporting events. The exciting IMCA Weekly Racing Series begins in late April and ends Labor Day weekend. Racing fans can enjoy the excitement weekly at Park Jefferson International Speedway in Jefferson, South Dakota. 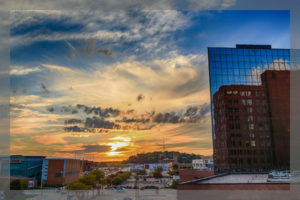 Sioux City’s climbing venue rivals anything in the Midwest and was built to a quality standard making Sioux City an eligible host for national competitions. 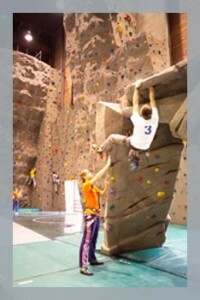 Rock climbing walls include a 52.5 foot tall tower, 42 foot tall competitive wall, 12 foot tall boulder and 5,900 sq. ft. of climbing space. Located near the Lewis & Clark ball park, Cone Park offers a tubing hill, ice skating rink, an outdoor fire pit, and a day lodge for warming, rentals, and concessions during the winter. The lodge will be used as a rental facility during the non-winter months and the ice skating rink will convert to a free public splash pad in the summer. A 2-mile trail loop is also available connecting with Sertoma Park to the east. In 2001 the youth of Sioux City expressed a desire for an exciting new activity known as disc golf. With the assistance of local businesses and volunteers, as well as the City of Sioux City and the Mayor’s Youth Commission the nine-hole Golf Course opened in the summer of 2002. The Disc Golf Course is located at Sertoma Park in Morningside by the big blue water tower. Fishing is a popular pastime in Siouxland. The following major rivers and lakes in the Siouxland area offer great fishing: Missouri River, Big Sioux River, Little Sioux River, Missouri River Oxbow Lakes, Brown’s Lake, Crystal Cove, Blue Lake, Snyder Bend Lake and McCook Lake. Our area casinos are designed to provide you with a memorable experience and countless hours of entertainment. Both public and private courses in and around Siouxland offer golf enthusiasts an opportunity to enhance their skills and enjoy their favorite sport. You’ll find beautiful courses for every skill level and every price range. You’ll be impressed with both the quantity and quality of the courses in our community. In November 2002, Golf Digest published their rating of the top 314 metropolitan area golf courses..Siouxland was ranked as number one in value and eighteenth over all in the entire United States. The Siouxland community offers a wide variety of exercise and fitness opportunities. From classes in yoga, spin cycling, aerobics, kickboxing, and tai chi, to free weights, weight machines and weight trainers; our health clubs have it all. Indoor basketball, tennis, handball and racquetball courts along with indoor swimming pools are all available. No matter where you live or work in the area, you have ready access to one of our community’s many health clubs. Hunters and the game they hunt are plentiful in Siouxland. The Siouxland area provides excellent ring-necked pheasant hunting, as well as wild turkey, white-tailed deer, fox squirrel, and bobwhite quail. Duck and geese hunters take to area lakes and the Missouri River to hunt their game. Game is abundant on both private and public property. 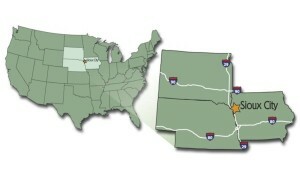 For a list of area hunting lodges, click here. To apply for a hunting license, contact the following: South Dakota Game, Fish & Parks, Iowa Department of Natural Resources, or Nebraska Game and Parks. The IBP Ice Center is open year-round for youth hockey programs, public ice skating, tournaments, figure skating and off-season inline skating and indoor soccer. Regardless of your age or skill level, if you’ve got an interest in athletic activities, chances are good that there is a club or league in Siouxland that is perfect for you! From highly competitive to simply recreational, we’ve got adult clubs and leagues for cycling, walking, running, soccer, golf, softball, basketball, hockey, ice skating, bowling, flag football, volleyball, swimming, fencing, horseback riding, skiing, martial arts, and more!